Yet another Raven Guard "conversion." I've only got one more model left to do in this small series and that's a dual Thunderhammer wielding Terminator Sergeant. He's not so much a conversion of a previous model as he's a scratchbuild. Both images above can be clicked on for the larger version. This guy took a little bit of work to get him convincing. He's on a resin base from Dark Arts miniatures, but I still had to add some rubble to prop his sword up on something. All it took was a bit of sprue, but it's one more litle thing when it come to conversion work and those add up quickly. I covered all the Ultramarine symbols on this guy and ultimately had no room to "sculpt" anything Raven Guard related. I ended up using the same color palette and lots of freehand to carry the model this time. I added some decorative trim to the inside of his cloak, and then a huge Raven Guard symbol on the back. His right shoulderpad has the chapter icon painted on it and you can see the same symbol on the small shield attched to his right shoulder as well. I kept with the pale skin and bald heads for unhelmeted guys. This guy is perhaps my favorite pewter model these days. The pose combined with the head make for a very menacing looking model. He was a bit of a challenge to paint as well. Since most of the trim on his armour is done in gold, I resorted to carefully blending my grey highlights from the edge outward instead of just a simple line highlight. That way, I still had the highlighting with the gold trim on the edges. In the areas where I could line highlight with grey, I did a combination of both the line highlight and the blending. All in all, one of my favorite models so far. You can see more of my Raven Guard work here. This model is ridiculous. I love the cape. I like how it's just the body and the raven's head is sort of the model's head. The raven on the cape is just amazining. The cape is fantastic-- especially the inside, which is still very Sicarius. I especially like how he's holding the plasma pistol now, and not the helmet. Stunning work all round, the free hand is fantastic! 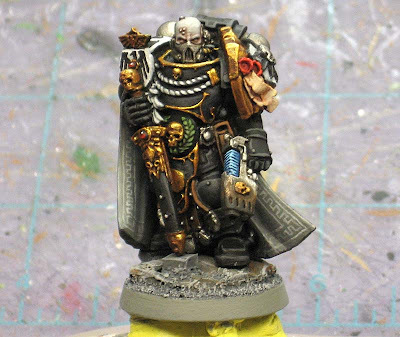 Well I am pretty much convinced now, I will be trying me hand at turning a Sicarius into a Relictor captain! You've really outdone yourself with this one... that cape is inspired! The freehand work on the cape is amazing, I cant even draw a straight line much less freehand one over a wavy cloak. Well done! Ron, the painting and design of the cloak is simply gorgeous. The conversion work complements Sicarius' character very, very well too. Awesome work, I love the back of the cloak!! Amazing, truly amazing work once again Ron, thanks for sharing it! wonderful free hand work on the cape, very inspiring, and timely as I am facing a similar cape issue. Another all-around awesome job, Ron. 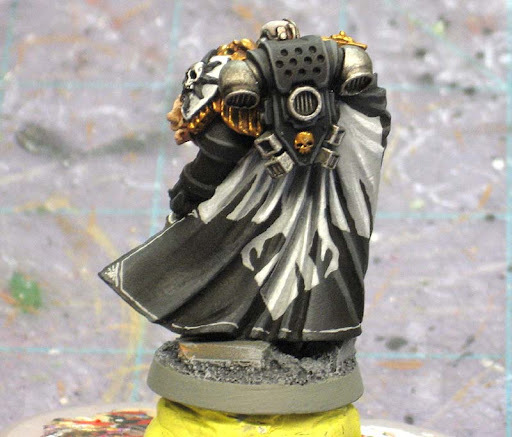 The symbol & freehand work on the back of the cape are very nice. This mini will stand out on the battlefield, for sure. Great job on getting the helmet off and adding the Plasma Pistol. Like everyone else is saying awesome work on the cloak both sides look fantastic. Very nice, sinister look, the cape is great. He looks great! The painting is all fantastic, but I especially like the work you've done on the cloak - great stuff! I've been following your Raven Guard paint-jobs / conversions and this is my favourite by a long way. The cloak looks brilliant - especially that Raven! - and the head really sets the model off well. Ron, this model is stunning, I love it! That's just... pure awesome. Excellent work, Ron, I just love the raven on the cloak. I wonder if I could do something similar for my Wolf Lord. Your Raven Guards are made of pure win, sir! Wow, thanks guys. I didn't expect to get this kind of response. I would have liked to add more "fine" detail, but I'm still perfecting my super-detailed freehand work. A great example of a beautifully painted Space Marine character, wonderful. I have made a note and might end up producing a copy - I like to model and paint GW Space Marine characters. Every time, I'm impressed by how well you manage to take the original, iconic 'non-RG' models, and make them your own. Flekkzo: Thanks, if I get another model with a cloak, I will document the process I use. I have one coming up in the next couple weeks for a Dark Eldar commision that I'll step by step through. It will have some freehand on it as well. Hi Ron, what a great model! Awesome conversion, your RG models are so neat! This captain must've taken a lot of effort. I love the matte black of the armor, and the freehands are super. This conversion is so good that it's changed my opinion about the Sicarius model. The best (or worst) with a blog like yours Ron is that not only do churn out awesome looking minis, but you have a way where you plant a seed in minds like mine that says "I should try that too". It is simply not just cool minis but also inspiration. I can't give you enough hobby thanks for doing so. Thanks once again everyone, I didn't this guy would net this kind of response. I figured I would get the standard, "looks good" and then he would fall to the back with the other posts. When I start my Dark Eldar project in the coming weeks, I'll do better at showing how I do his cape/robes and freehand. Looks great! I'm very impressed with your freehand work - as many others have said, the cape looks amazing. Stunning. Very very nice work. Thank you very much for sharing. I may do another one of these models for myself if I get the time this summer. I love this guy. Does anyone know what head that is? I'm a major raven guard fan. I love RG soo much i got a tattoo of their symbol and motto on a rolling parchment thing on my left shoulder. I'd pay $150 for that model(^_^). amazing work!!!! Anon: Thanks! I'm glad you like him. He's a simple conversion, but he came out looking like he's always been that way.